A newborn baby lovebird is a wonderful bundle of joy. Its birth is both a happy moment for the owner and for its parents. In this article, we will take a look at the signs of hatching in lovebird eggs, how to care for newborn babies, and how to care for the parents as well. Lovebirds lay a lot of eggs after mating, but not all of them will hatch into chicks. Generally, one or two eggs will hatch out of ten eggs. Sometimes, none of the eggs will hatch! At times, it may happen that one chick may be hatched after a mother lovebird lays around 40-50 eggs. This happened in my case with my female lovebird, Lulu. The white color of the eggs changes from a light gray to a dark gray. This indicates that a baby is growing inside the egg. If any of the eggs laid by the mother lovebird contain babies, she will sit on them (incubate) continuously without much break. She will appear fluffy and slightly bigger than her normal self. This way, she provides the necessary heat for a chick's growth. This is another obvious sign that a chick may hatch after this period. While sitting on her eggs, the mother lovebird will shred paper that you provide for the nesting. This behavior will increase significantly during incubation (nesting behavior). This way she builds a nest for her upcoming babies, which is another sign of hatching. A mother lovebird tends to be aggressive, especially when we touch her cage. They feel that we may try to harm her eggs. She may try to bite the male lovebird, too. At this stage, try your best to give her space and don't do anything which annoys/angers her. The mother lovebird sits on her eggs and doesn't eat. The male lovebird feeds her (regurgitation) every few hours and this is an obvious sign of an egg hatching. The first sign of a chick hatching will be its cry. It will make small crying sounds every now and then. I still remember how my lovebirds, Mumu and Lulu, had their first chick hatched. It was born earlier this year on the 13th of January. 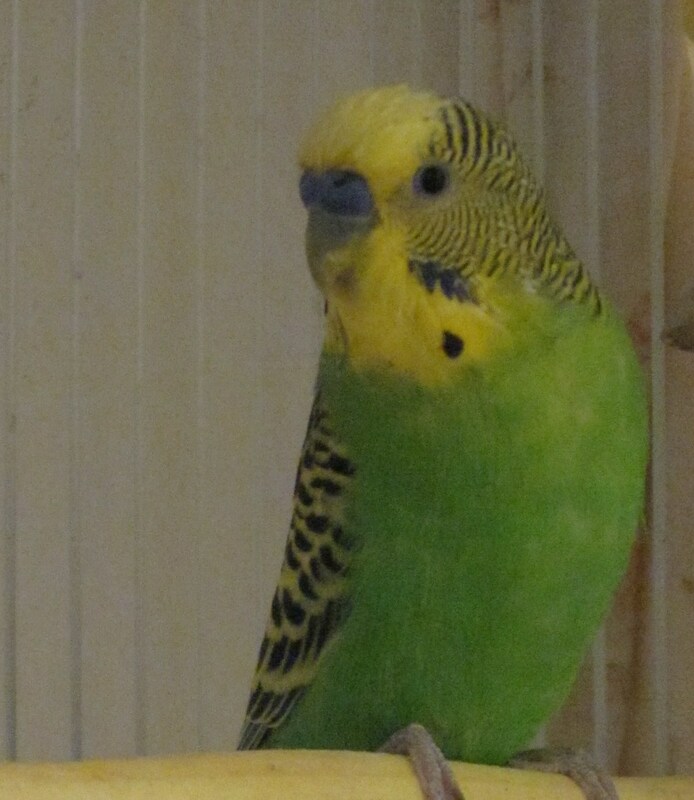 Mumu had chirped continuously from his cage, but we didn't know why. We had assumed that maybe he was simply chirping. When I opened his cage covers, I noticed a newborn baby kicking its legs in the air! Make sure that the baby lovebird is placed in the nest box. It should be kept between two unhatched eggs for support. This way if the baby rolls around, it will stay remain in the same position. Make sure that the baby is being properly fed by the female lovebird; you will notice her feeding the baby. She will bring up food in her beak and feed it to her chick. Be sure to provide fresh water, healthy foods like corn, spinach, seeds, apple, banana, and crushed egg shells to both the parent lovebirds. In some cases, it's possible that a female lovebird won't feed the chick properly. In such situations, you should gently take the baby in their hands and try to feed it a little lovebird formula. You can feed the chick by using a syringe. It might reject the food from you in the beginning, but do try until it accepts the formula. Do make sure that the formula is thin, without lumps, and slightly warm. Avoid crop burn by making sure the formula is just below body temperature—a thermometer can be used. Warmth is something that is necessary for a chick's growth. Along with healthy food, it also needs warmth and proper sleep to stay healthy. Cover your lovebirds' cage even during summers. You can use light pillow covers to do this. In winters, make sure to put baby blankets around the cage so that the chick as well as its parents, stay warm. If your area has extreme winters, make sure to cover your lovebirds' cage with heavier blankets to provide extra warmth. Your lovebirds' cage should be cleaned daily, along with the seeds and water bowls, too. Fresh food should be provided whenever required and no food should be kept in the cage for more than two hours. 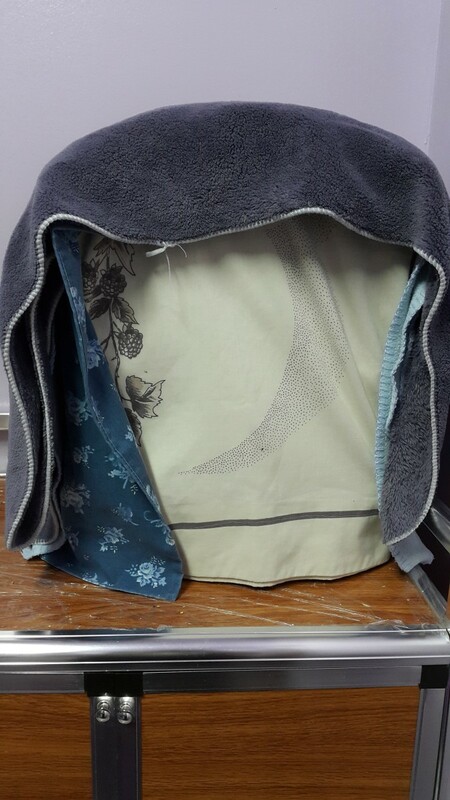 Towels, papers, and magazines can be used to put over the base of the cage. 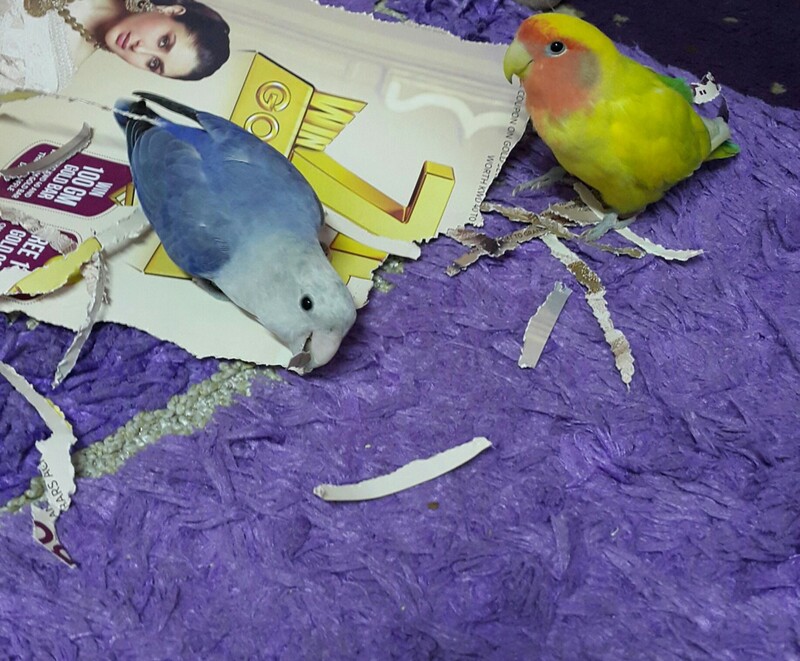 Besides helping in keeping the cage warm, female lovebirds require papers for shredding and playing. Clean the dried grass inside the nest box whenever you feel wetness. Ensure the grass is never wet or else the baby might get sick. Newborn baby lovebirds are really tiny and require lots of sleep. Ensure that the chick is getting proper and peaceful sleep at all times. Make sure they are well fed. Fresh water and healthy foods should be made available at all times. Seed and water bowls should be cleaned properly. The cage's base should be covered with paper. Make sure your lovebirds are not bored or frustrated. It's important to give them attention too. Let your pets out for playing and make sure they are happy. Ensure that your lovebirds are getting peaceful and uninterrupted sleep for at least 12 hours. Hand-raising newborn lovebirds is a difficult task, but with proper care and attention, they can grow into loving and healthy pets. My lovebirds' chick didn't survive for long, but I'm happy that I got the opportunity to raise my male lovebird, Mumu. This article is about hand raising a baby lovebird. Based on my personal experience I have shared tips and suggestions. Hand-raised birds are the most loving and loyal pets one could ever find. My lovebird does not take care of her newborns so they die. This is the third one. Can I take the newborn out and feed it myself? Does it need a cage? You can definitely feed the newborn yourself. You don't need a cage, you can place the chick in a brooder filled with dried grass. That will help in keeping it warm. My lovebird hatched five eggs, but only one survived. I keep the birds outside, with temperatures of 18°C at night and 30°C in the day. The place is shady. The female stays in most of the time. I noticed the little one is breeding fast. Is this normal? Now I have moved the cage inside and temperature is 25°C. The chick is two weeks old and no feathers yet. Any tips are welcome. The lovebird chick will have at least some feathers, is it totally skin? And yes, they do grow up quickly. Where do you keep the chick? This is important to consider. 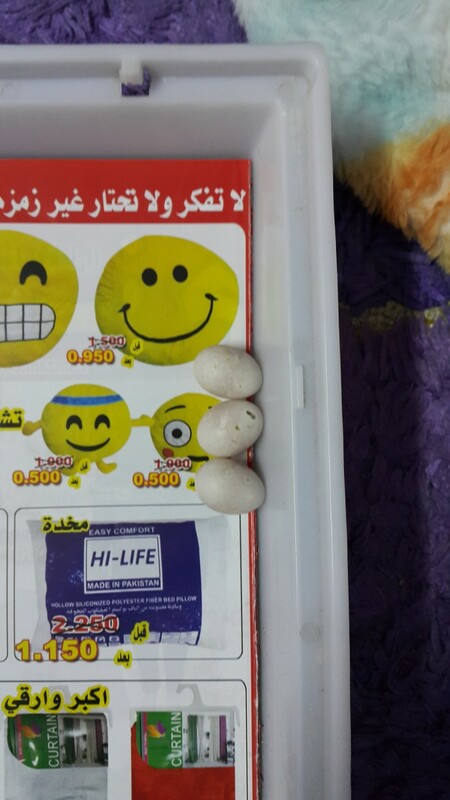 Our lovebird has eggs, but all them did not hatch. Only two babies came out, and the mother is hitting the baby's head. She is not feeding it and is pushing it down. What should I do? Is there a wound on the chick's head? If this is the case, remove the chicks and place them in a brooder; they will be safe there. How old do the chicks look? Try feeding them yourself. Why did my male lovebird throw an egg from the nest? The egg might have been touched by someone, or the lovebird might think it's contaminated. My lovebird is not feeding her newborn hatchlings. Is it ok to put them in a nest box with my other female lovebird and her babies? I'm not sure if the other female lovebird will accept the newborn chicks. Try putting them near her. If she doesn't feed them, you need to feed them yourself. Can I feed the baby lovebirds by hand and put them back in the nest? Will the parents continue to feed them? Will the parents reject them? No, they won't reject them. It's best to feed them once they are at least two weeks old. It is easier to hold and handle them then. I just noticed that my lovebird laid an egg, but it's been a couple of days, and there's only one. Should I be worried that there are no other eggs? A female lovebird lays an egg every alternate day (a clutch of 4-6 eggs). Do you see the bottom of your lovebird bulged? That means she is pregnant, but can't lay the egg. If this is so, please give her crushed egg shells and place her in warm water. What should you feed a newborn lovebird who has fallen from a tree? You can give the newborn lovebird formula feed. It will be available at a local pet store. 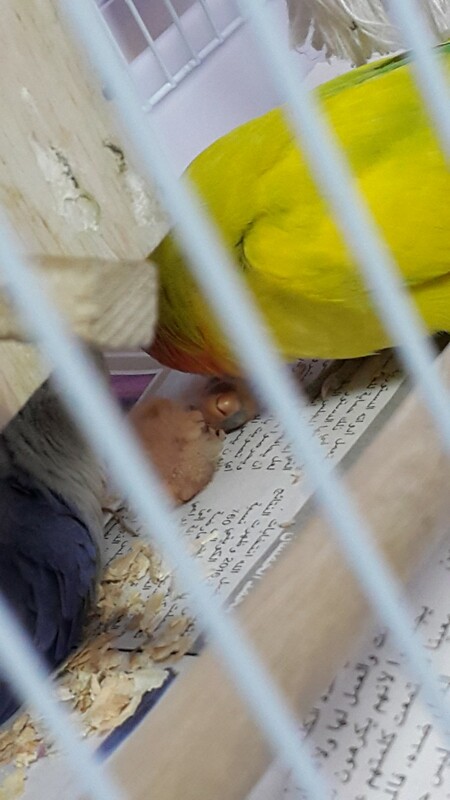 My baby lovebirds are hit by their mother. The babies are bleeding. What should I do? That's a serious issue. Separate the chicks from the mother lovebird immediately. Apply turmeric powder on the wounds, and give the chicks plenty of rest. Hand feed them if they are younger than 1.5 months of age. 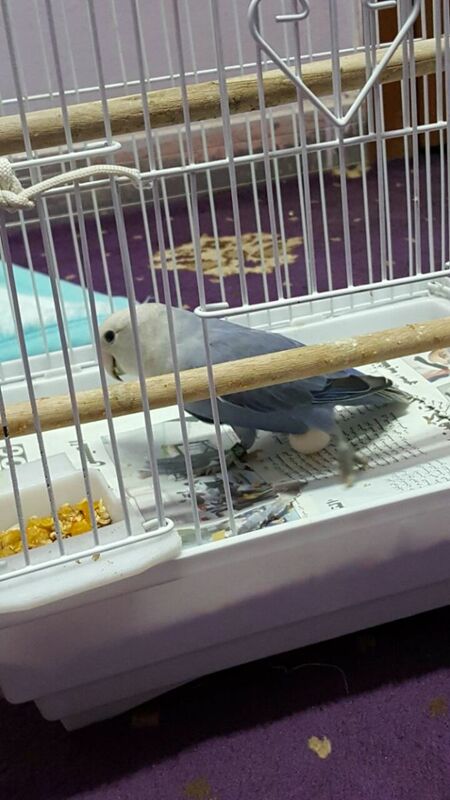 What should I do if the mother of the budgie bird is not feeding her 1-day old baby and throwing her out of the nest? How should I feed the baby? You can make a very thin formula feed for the chick. Please feed the chick slowly and in a gap of 2 hours. I have 3 lovebird chicks and each bird was born at an interval of 2 days. The first chick is now 2 weeks old which is comparatively bigger than the other two. Does this mean the parents are not feeding the other two lovebirds properly? Growth differs in each lovebird. But if this is the case, you need to hold the other two lovebirds and feed them. Can I move an egg that was just laid on the bottom of the cage into a nest? Will mama lovebird take care of it? Yes, you can take it with a spoon and transfer it to the nest box. I have three baby lovebirds in the nest. If I take the oldest chick out to start hand-feeding, will the parents still feed the other babies? Yes, you can take out the oldest chick and hand-feed him/her. The parents will continue to feed the other babies. My Lovebird laid four eggs. Two of them hatched and one died. Can I take it out the nesting box? Yes, the unhatched eggs must be removed. One of my neighbors will be giving me two baby lovebirds sometime soon. I am planning on hand-feeding and training them. I was wondering how I would keep the babies warm, since their parents will not be there to sit with them. Will the pillows and blankets be enough to keep these babies warm? A brooder is enough to keep two babies warm. You can see a brooder's picture online or view my article, "Hand-Raising a Baby Lovebird: A Personal Experience" for more information. A brooder must be filled with dried grass, and the chicks can be placed on it. My lovebird babies haven't sat up yet. My first is ten-days-old and the other is one-week-old. Should I be worried? No, you shouldn't be worried. They will take time (at least three weeks) to gain strength and sit or stand up. A couple of my friend's baby birds died. She thinks she may have done something wrong. But after reading this, I don't think she did. Why do you suppose they died? Survival is difficult and death is common in young birds. It's really sad to see this but that's the way it is. My lovebirds somehow broke their eggs. 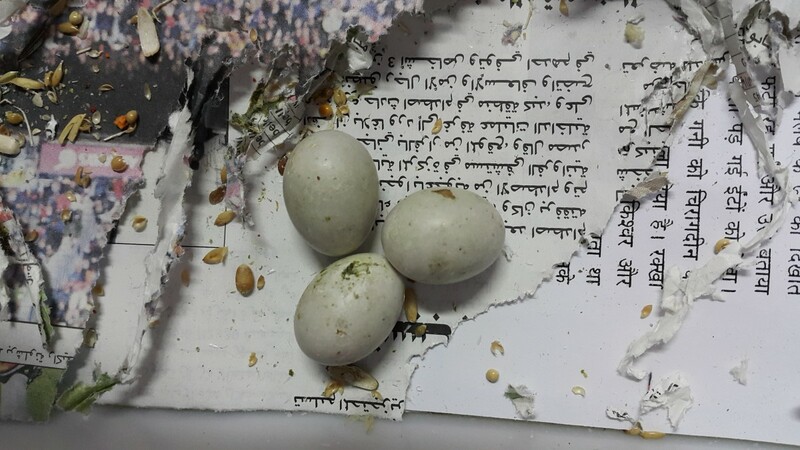 They had three eggs, then two of them broke. I inspected one of the eggs and saw a baby inside covered in yellow goo. Is there a chance those eggs can survive? One of them just broke a few minutes ago. If the chick is alive, you will see movement. If the egg broke before it was time for it to hatch, then the chick won't survive. If possible, you can incubate the eggs yourself (since your lovebirds are breaking the eggs). Help! The first egg has hatched, but the male began nibbling on the legs, so I thought he was just cleaning it, but I noticed that the legs were red and swollen. He dragged the baby out of the nest and left it. The female didn't look concerned, and they stepped on it on their way in and out of the box. We took both birds out and with a stick, we nudged the baby back in, but the mother doesn't seem to be doing much about it. And the baby does not seem to be squirming nor breathing. What do I do? If the baby lovebird doesn't show any movement, it means it's dead. If this is the case (with the parent lovebirds), please keep the eggs in an incubator (they will be safe) and hand-feed the hatchlings. Can I hatch my lovebird's rejected egg? Yes, you can. Buy an incubator and place the egg inside it. It will hatch once it has been provided with continuous heat. I have two baby lovebirds that are one week old. When will their feathers show? Their feathers will start developing once they are three weeks old. The progress will go on until the chicks are six months old. I am living in UAE. 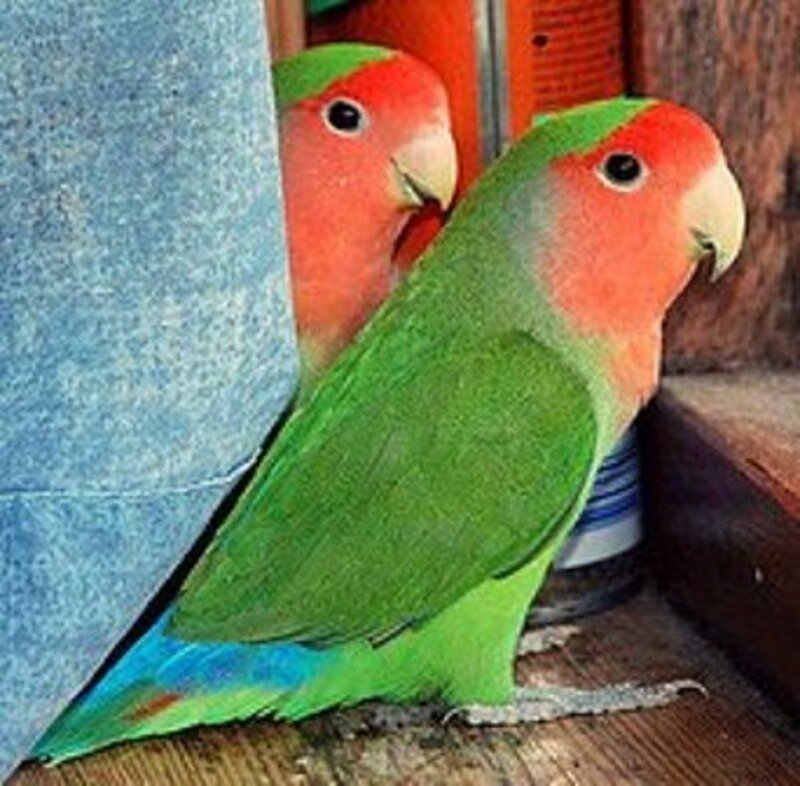 My lovebirds are out in the balcony, so what kind of cloth should I cover them with? What kind of seeds should I give them? Can I give them boiled egg shells? Please make sure they are not under direct sunlight. Bring them inside, cover them up with a light cotton cloth in summer and a baby blanket in winter. The seeds for lovebirds are available in a local pet store. Yes, you can give tem boiled egg shells (crushed into small bits). Can I hand feed newborn lovebirds? You can definitely hand feed them. But an age of around 3 weeks in an lovebird makes it easier to handle them. I have separated the father, and yes, the baby did pass. But another lovebird has hatched, and the mother seems to be protecting it. If I keep food and water in close reach to her, she won't need his help, right? I don't want him attacking the new babies. Do I remove the dead one? Also, I do not want to incubate them because I am not a professional breeder or anything. You don't need to be a professional to do this. Yes, if the food and water are close by, the mother lovebird will find it easier. I hope she doesn't get agitated without the male's company. Please remove the dead lovebird. 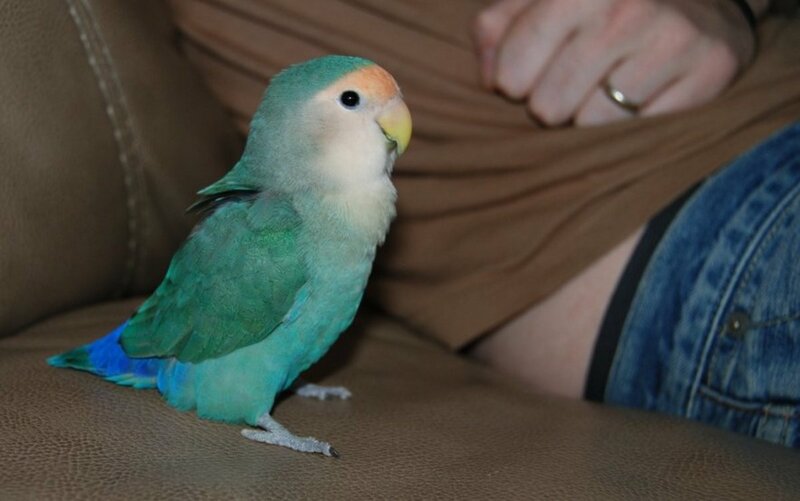 We just bought a one-month-old, blue lovebird. I'm in Taiwan and I don't have the things needed for warmth. I use a heater, is that okay? You can buy a brooder for your baby lovebird. That will be enough to keep it warm. One of my male lovebirds is injured, and his right leg has a small fracture. He can't sit properly. What can I do now? That's really serious. Please take him to a vet as soon as possible. You can apply turmeric powder on his leg, it will stop the bleeding (if there is any). Please keep the lovebirds, who fight, away from each other. My lovebird laid 3 eggs and 2 of them have cracked. What should I do? Please discard the cracked eggs. How long does it take for the beak of a baby lovebird to go from black to yellow? Both my lovebirds died today in the morning. They left their eggs, I don’t know what to do with them. How should I care for these orphaned lovebird eggs, since they’re almost two weeks old? You can give them heat. Place them in a brooder and put a small bulb near it. The eggs will hatch after 7-10 days if fertile. If the crop is bulged or appears like a ball, it means the chick is not hungry. If it's flat, it means he/she is hungry. Chicks tend to chirp and be active. Try to pet him/her more and see if he/she falls asleep for a longer time. Please give your birds multivitamins. They are supposed to eat try giving them spinach leaves or different food items. The bird formula will be available in a local pet store. Hi - our lovebird mumma is pulling her feathers out and looks really scruffy now - I'm slightly worried! She's seems OK in herself but just looks poorly. She chucks the bedding we give her out and when we've left fresh foods for her she doesn't eat them - nor does Daddy bird. Is there anything more we could be doing? Also - where do you get the baby bird formula? Do you make it yourself or can you buy it? Many thanks!!! I'm really sorry to hear this. Was Peaches feeding these chicks as well? Did Kisses assume Peaches would feed the chicks? @Shaun99 Hi! Thank you so much for the warm words. I think something must have scared the chick. Is there anything new in the environment? Please feed the bird (even though he/she is trying to run away). I would suggest you to bond with the bird, pet his/her head after feeding is done and gently put them to sleep. I hope the chick will not be scared. Feeding is important, or else the chick may become weak and may not be able to survive. Please feed the bird the same amount like before. Don't let him/her run away. Your posts are really informative thanks. I have a quick question, I bot a 3 week old chick 10 days ago and was handing feeding it with appropriate formula and it used happily eat around 5ml, but suddenly since last 2 days it's hardly eating 1ml even thou it cries and the crop is almost empty, when I try to feed it just tries to run away and doesn't want to open its mouth, any idea why is it behaving this way? @James Hi! :) Parent lovebirds are ready since the eggs are laid. It doesn't take any extra time. When the baby lovebirds hatch their eggs, how long it takes for them ready for parenting? @Anonymous Broken eggs don't survive. I'm sorry. Let the lovebird lay eggs next time. Why did you give heavy food to your bird? Lovebird babies are supposed to be given thin bird formula. @Sandhya Hi! Please remove the dead chicks from the nest box. @Radhika Hi! You can feed them little amounts of pulp made from fresh fruits like apple. Give them a little amount of mashed banana, corn and spinach leaves. These foods are healthy for them. @Chandana Hi! :) Give your lovebirds seeds, apples, bananas, corn, spinach leaves and crushed egg shells. These foods help them stay healthy. The babies will be fed by the mother lovebird. @Mimi2008 Hi! :) That's a common issue in lovebirds, especially females who tend to get aggressive. What you can do is, separate the baby lovebird and put him/her in a small brooder or cage if preferable (since the chick is 5 weeks old). 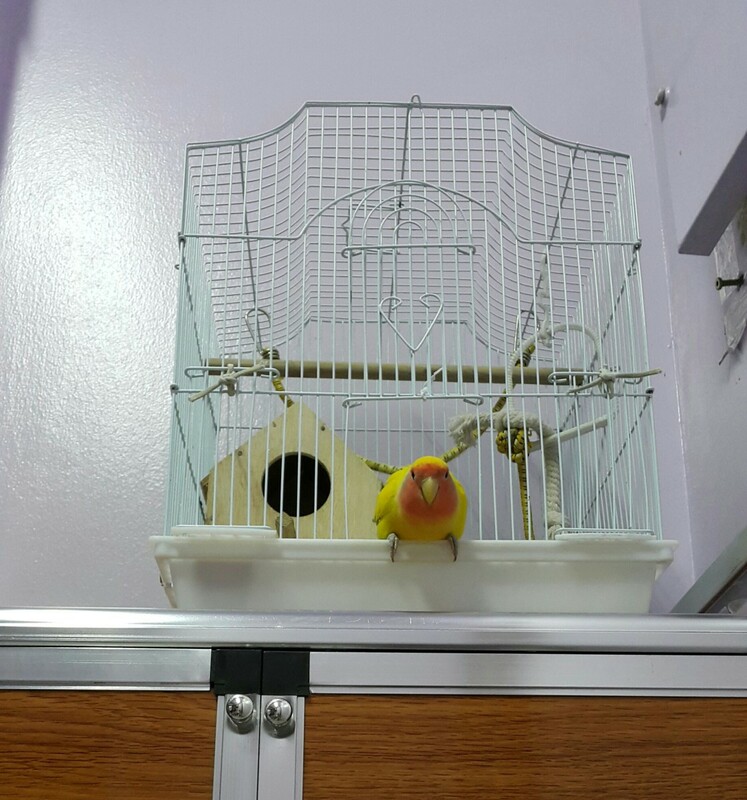 Keep the door of the chick's cage open so that the mother lovebird can get access to it. Do keep it mind that the chick may find it uncomfortable if placed in the cage. So, keep him/her at least for one hour in another cage and put them back near the mother lovebird. The father lovebird, if kept in another cage, will feel lonely without the female. So, I don't think it's okay, but if the problem continues, do try keeping the male away and see what happens. Hope this helps. HI !☺,I have a few urgent questions that I would really like you to awnser please.the mother keeps attacking the father because she is being protective over her 5 week old baby, and the mother keeps on being extremely aggressive and won't let the father eat or drink .we are wondering if we should move the father out of the cage and seperate the mother from the father . And if we should seperate them, then how long should we seperate them? @Dfair13280 That's good to hear. 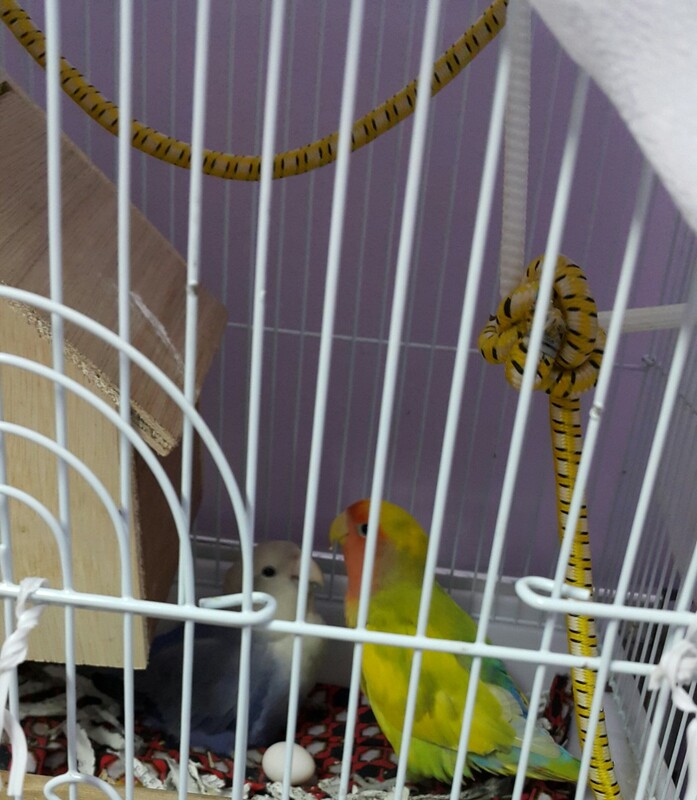 :) Are the baby lovebirds liking this three-tier cage? Are the parent lovebirds okay with it? Ok ty I also built a large cage into a three tier and put them on top with access to middle cage where mom and dad are that can be sealed. @Dfair13280 If this is the case, keep the baby lovebirds in their own cage for an hour or so, not for the whole day. Since it's a new environment, they will take time to settle in. I did mention before that if the bird doesn't like the cage, he/she will show discomfort. Please don't let them be depressed. Ok I put them in their own cage for only the day they kept crying and mom did too so I will let them spend days in their own cage for a week before permanently moving them. My heart was breaking from the crying. Dfair13280 Yes, you can put your lovebirds in a cage and make sure you include safe toys and perches for them. Since they're new to that environment, they may take time to settle in it. Do keep those 3 tents at the base of the cage as well, they will get a sense of familiarity. Can I put them in their own cage now? So, when you place the chick in a brooder (close to the cage), you can feed him/her and also keep the lid open. The mother lovebird can come out of the cage and climb the brooder if she wants access to the chick. 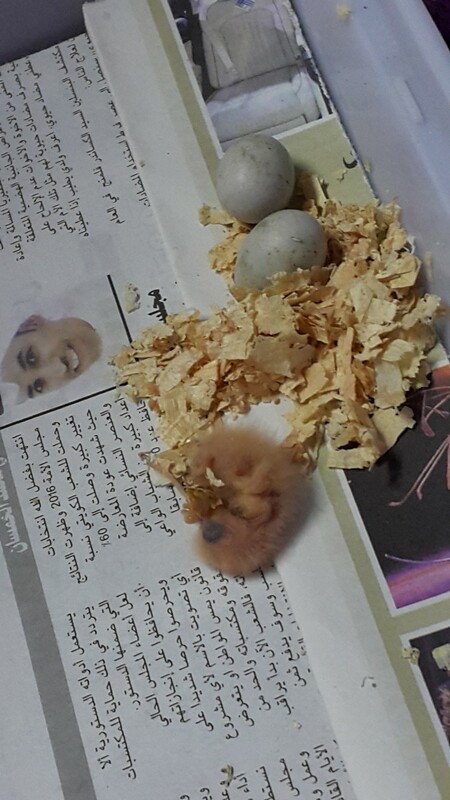 Hi, My baby bird is 3 weeks and 4 days old and when I try to take it out of the cage the mother becomes EXTREMELY aggressive, when I take it out it's very difficult to put the baby back in the nest box. I am not sure if I should be removing the nest box and if I should keep the baby in the same cage. I want to be able to play with baby but still give access to the mother to feed it. @Dfair13280 Those sound exquisite. :) Thanks for sharing. P.S. The chicks' names are really cute. What are the names of the parent lovebirds? Thank you I also put in 3 separate tents at different levels and this has helped. Yes the oldest is eating on own and the middle too. The mother only seems concerned about the youngest. She even bites the dad for feeding the other two. I have named them Red(because has red spot on tell), Comfort (because very secure), and Hope(because so tiny). 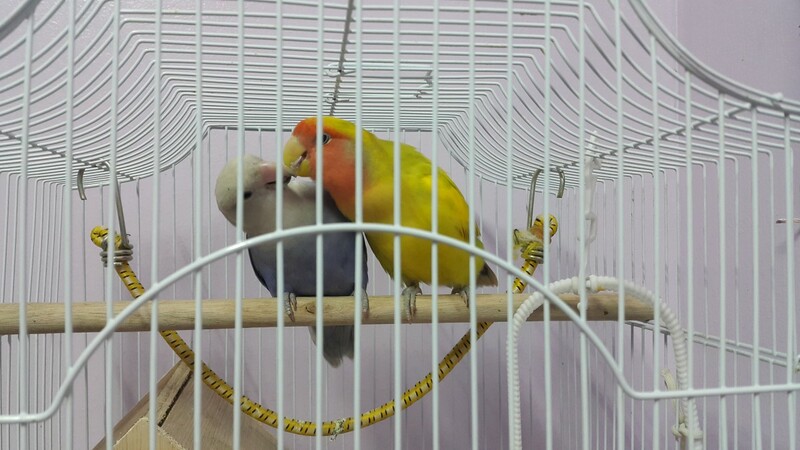 @Dfair13280 Yes, it's better to separate the oldest lovebird and place him/her in another cage. I think the mother lovebird is biting the chick because he/she is old enough to eat on their own. Is this chick not eating on his/her own? Hi the oldest bird gets bit by mom now when in the brooder or when returning to brooder or begging for food should I intervene? I have a cage that can be separated should I separate or put him/her in own cage? Also the male bird keeps getting out I don't know how but when I come in he's out and can't get back in. @Mimi2008 You can put the baby lovebird in the cage for little periods of time. And no, the parents lovebirds won't abandon the chick. Do let interact for a few hours every day. They will feed the chick as long as they find it necessary. You can feed formula during this time period too (make sure the bird is 3 weeks old, that way it's easier to hold them). @Sakina Hello and thank you for your prompt response. If I move the baby bird to a brooder now, how will the parents access it?and will the parents continue to feed it until the 3rd week passes and I can feed the formula. Also if I start the baby on formula on the 3rd week will the parents abandon feeding it? @Mimi Hi! 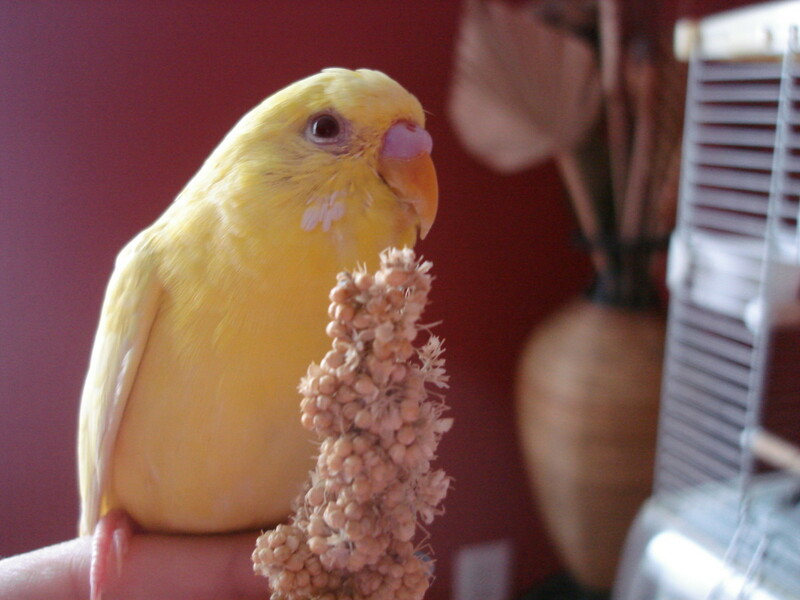 :) You can take out the lovebird chick from the nest box and place him/her in a brooder now. Once the chick is around 3 weeks old, you can feed lovebird formula then. The parent lovebirds will stop feeding the chick and will encourage him/her to feed themselves (the weaned stage) when he/she is around 1.5-2 months old. You can throw the old eggs away since they're not fertilized. I have 2 adult love birds and 1 layed 7 eggs and only 1 hatched. It hatched on May 21st .i have a couple of questions.I am wondering when I can take out the baby chick from the nesting box and if I feed it formula will the parents continue to feed it or will the parents abandon the baby and stop feeding it?And what should i do with the eggs that did not hatch should we keep them or throw them out? @Dfair13280 I think the mother lovebird wants him/her to become independent and get used to the cage. The mom keeps trying to bite or block him/her from the box but eventually let's him her back in should I do? The dad feeds him/her mom doesn't. @Dfair13280 That's nice to hear. The lovebird might want to explore the cage. You can put him/her inside it and observe the activity. If the bird likes it, he/she will stay inside. If not, you'll notice discomfort. Ok I will also the oldest bird got flew back to cage from about 10 feet away I was cleaning their box and the cage. Is it time to put in a cage? He/She is also eating seeds. @Dfair13280 My lovebirds are crazy about spinach leaves. Do try and let me know the progress. Crushed egg shells help their calcium levels grow. You can sprinkle that over their food twice in a week. Please make sure the egg shells are tiny. The male will only eat carrots apples corn. The female will only eat apples and corn. I have not tried egg shells, grapes, or spinach leaves but I will. @Dfair13280 Yes, I think they lack vitamins in their diet. Do incorporate banana, apple bits, grapes (once every week), crushed egg shells, spinach leaves and corn in their diet. Make sure they don't eat any seeds of fruits. The two oldest one is getting feathers on it's back but you can still see spots should I be worried? The youngest one has all his/her feathers. Do they need vitamins? @Dfair13280 They should have gotten their feathers around 6 weeks of age. Where are they missing feathers? Beating wings is a good sign, they will learn to fly soon. Also, you can transfer them into cages once they are 2 months old and give them a bath then too (place a vessel full of lukewarm water next to them and see if they jump in). Ok I put them down for a little but put divider in the mom tried pulling baby through the bars the baby is ok geez scary so I will put up a board on the lower half so she can't grab the babies. Also the older two are eating seeds they still don't have all their feathers though. The little one is usually alone and hungry he/she will eat the formula. The older two also are starting to beat there wings. When can I give baths? When can they go in their own cage? @Dfair13280 If the older lovebird doesn't want to stay at the bottom of the cage, you can put him/her back. You can put the bird at the bottom of the cage for a little time every day. Hi the oldest baby bird flew out of box today down to bottom of cage. I let him/her stay for a little but he/she started to struggle to get back in the box. Should I have not put him/her back. I also put the middle one back also a few days ago this one is very confident though. The older one is timid and nervous so I was shocked to see him/her fly down. @Dfair13280 You can start giving seeds to the chicks born on April 27 and May 3. The chick born on May 8 shouldn't be given seeds now. April 27th May 3 and May 8th are when they were born. @Mari Hi! :) The lovebird formula should be slightly warm to touch, preferably lukewarm so that it doesn't burn the chick's throat. What temp should the formula have? @Dfair13280 Hi! :) How old are the chicks? If they are older than 1.5 months, you can start to give them seeds, soft fruits like banana and mashed apple and small bits of spinach leaves. The parents probably don't want to wean (get accustomed to feeding on their own) their chicks yet. I have had all three in brooder with parents having access. The small one is always hungry and I pull to feed when I can the other two will not feed from me. When can I put them in their own cage I have tried to put seedin the brooder but the parents push it out and even nips at older two for trying to eat it. What can I do at this point? @Dfair13280 That's nice to hear. The male lovebird is afraid, that's why he yells and nips at her. Eventually, he'll get rid of his fear and take treats from your hand as well. How are the chicks doing? Have they settled well in the brooder? But, if you find them getting anxious or leaping towards you to bite your fingers, then don't touch them at that moment. Are the parent lovebirds pets? Dfair13280 Hi! :) That's good to hear. A brooder will keep the baby warm. There's no need to place a heating pad under it. Thank you I put new cage against the cage and they are going back and forth on Thursday I will close it after they are comfortable and move babies to the new nesting box. I'm not sure about a brooder because I don't have heating pad to place under it. Any other suggestions? @Dfair13280 Hi! Do you let your birds out for playing? That is the easiest way to clean a cage thoroughly if they are out of it. If you don't let them out, you can open the cage door and tie it to the main cage with a nylon thread. Then, place your smaller cage (with an open door) just opposite to it with a little space between them. Once they move to the smaller cage, you can remove the nesting box and place the babies in another one. Hello, I have a few questions. My love birds laid five eggs 3 hatched. They are in a big flight cage but I need to move them to a smaller cage because I'm downsizing. Should I move them to new cage and babies to new nesting box? The cage they are in is in need of thorough cleaning too and I don't have access to check the babies only through the hole the mom and dad enters through. I try cleaning cage but the male is aggressive when I open the door, can I remove mom and dad clean the cage and put them back? I really need to change there cage though for the move. First baby born april27 second may 1 and 3rd may 8th. @Cindy M Hi! :) That's good news. 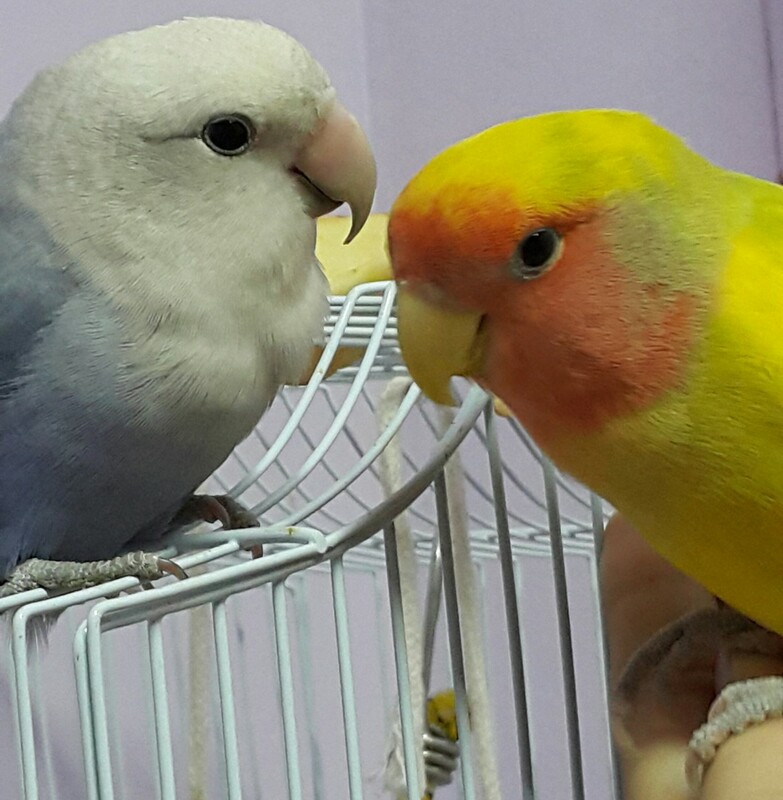 Are your budgies and lovebirds friendly with each other? If so, it's okay to let them be in the same cage. If not, you can move your lovebirds, the eggs, and the nest box in the smaller cage. 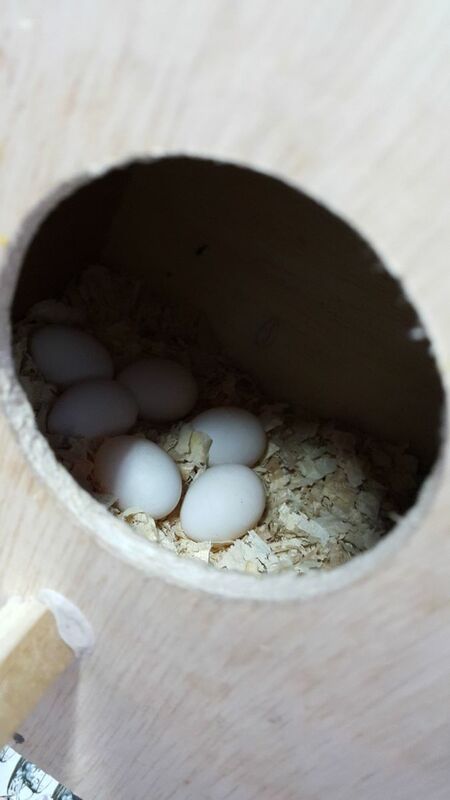 I have 2 budgies and 2 love birds in a large cage together and today I discovered 3 eggs in my love birds nesting box. I have a smaller cage like the one showed in your article and my question is should i move my love birds and the eggs (and nesting box) to the smaller cage? Hi! :) Please don't touch the baby chicks if your bird is not comfortable. 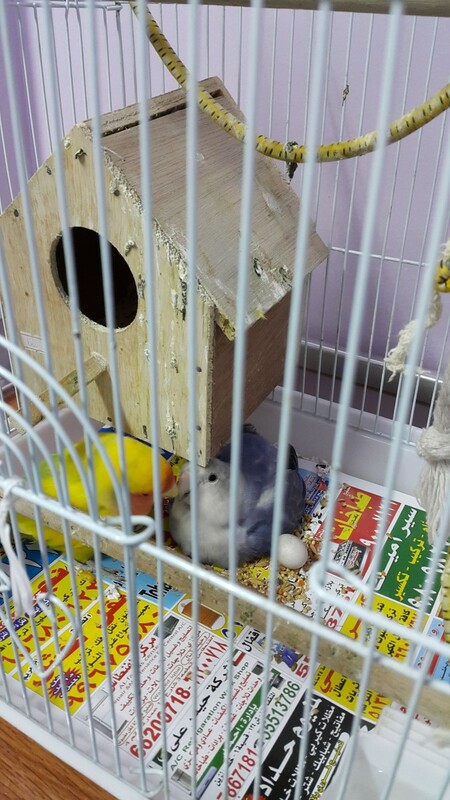 What do I do if my parakeet does'nt let me touch her baby chicks? I'm so sorry the chick did not live, but thank you for sharing your experience. Hopefully, you'll have another little Mumu to raise someday. Congratulations on your new family members! I really like the way you set it let us know all of the correct steps. Good luck.